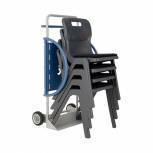 Titan One Piece Chair Trolley KF74044 Pack of 1 Titan One Piece Chair Trolley Kills 99. 9% of E-Coli and MRSA (Super Bug). 100% safe to humans. Anti-fungal growth. Effective for 10 years. Blue colour varies between sizes. Non returnable. 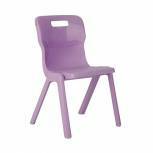 Titan One Piece Chair 380mm Purple (Pack of 30) KF78622 Pack of 1 Ideal for impromptu seating additions or replacing unusable chairs, this Titan one piece chair is lightweight and easy to carry. Pack of 30 purple chairs. 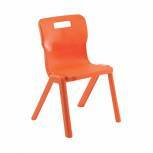 Titan One Piece Chair 430mm Orange (Pack of 30) KF78632 Pack of 1 Ideal for impromptu seating additions or replacing unusable chairs, this Titan one piece chair is lightweight and easy to carry. Pack of 30 orange chairs. Titan One Piece Chair 310mm Charcoal KF72157 Pack of 1 Titan One Piece Classroom Chair. Contemporary, sturdy chairs with a unique leg system that actively prevents children from leaning back on their chairs. Conforms to EN1729 parts 1 and 2. Seat Height - 310mm. Colour - Charcoal. Non returnable. Titan One Piece Chair 430mm Red (Pack of 10) KF838699 Pack of 1 Titan one piece red chair. Lightweight chair ideal for impromptu seating changes, and stackable to maximise space efficiency. Titan One Piece Chair 430mm Blue (Pack of 10) KF838700 Pack of 1 Titan one piece blue chair. Lightweight chair ideal for impromptu seating changes, and stackable to maximise space efficiency. Titan One Piece Chair 430mm Green (Pack of 10) KF838701 Pack of 1 Titan one piece green chair. Lightweight chair ideal for impromptu seating changes, and stackable to maximise space efficiency. Titan One Piece Chair 430mm Charcoal (Pack of 10) KF838702 Pack of 1 Titan one piece charcoal chair. Lightweight chair ideal for impromptu seating changes, and stackable to maximise space efficiency. Titan One Piece Chair 430mm Yellow (Pack of 10) KF838703 Pack of 1 Titan one piece yellow chair. Lightweight chair ideal for impromptu seating changes, and stackable to maximise space efficiency. Titan One Piece Chair 310mm Red (Pack of 10) KF838704 Pack of 1 Titan one piece red chair. Lightweight chair ideal for impromptu seating changes, and stackable to maximise space efficiency. Titan One Piece Chair 310mm Blue (Pack of 10) KF838705 Pack of 1 Titan one piece blue chair. Lightweight chair ideal for impromptu seating changes, and stackable to maximise space efficiency. Titan One Piece Chair 310mm Green (Pack of 10) KF838706 Pack of 1 Titan one piece green chair. Lightweight chair ideal for impromptu seating changes, and stackable to maximise space efficiency. Titan One Piece Chair 310mm Charcoal (Pack of 10) KF838707 Pack of 1 Titan one piece charcoal chair. Lightweight chair ideal for impromptu seating changes, and stackable to maximise space efficiency. Titan One Piece Chair 310mm Yellow (Pack of 10) KF838708 Pack of 1 Titan one piece yellow chair. Lightweight chair ideal for impromptu seating changes, and stackable to maximise space efficiency. Titan One Piece Chair 350mm Blue (Pack of 10) KF838709 Pack of 1 Titan one piece blue chair. Lightweight chair ideal for impromptu seating changes, and stackable to maximise space efficiency. 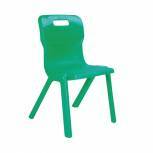 Titan One Piece Chair 350mm Green (Pack of 10) KF838710 Pack of 1 Titan one piece green chair. Lightweight chair ideal for impromptu seating changes, and stackable to maximise space efficiency. Titan One Piece Chair 350mm Charcoal (Pack of 10) KF838711 Pack of 1 Titan one piece charcoal chair. Lightweight chair ideal for impromptu seating changes, and stackable to maximise space efficiency. Titan One Piece Chair 350mm Yellow (Pack of 10) KF838712 Pack of 1 Titan one piece yellow chair. Lightweight chair ideal for impromptu seating changes, and stackable to maximise space efficiency. 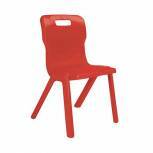 Titan One Piece Chair 380mm Red (Pack of 10) KF838713 Pack of 1 Titan one piece red chair. Lightweight chair ideal for impromptu seating changes, and stackable to maximise space efficiency. 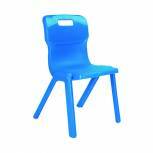 Titan One Piece Chair 380mm Blue (Pack of 10) KF838714 Pack of 1 Titan one piece blue chair. Lightweight chair ideal for impromptu seating changes, and stackable to maximise space efficiency.